I guess the French administration is getting serious about recycling. In Paris they do take it seriously. At my old building, everything went in bins in the basement. To me that’s the gold standard; of course, it’s how we did it in California. In the new one we dump bottles at the corner but the rest goes into bins. It’s not bad. At the house, no, I think the trash guys must love their landfills. When it comes to recycling, they take a definite passive-aggressive attitude toward the whole thing.Some kids came out the other day to give me a new bin and instruct me in the art of trash dumping. I’m old. I can’t help but think of men and women just out of college as kids. So there they were, sweet little true believers, trying hard to be polite as they explained to the old Luddite standing in front of them that the trash was just all wrong. I didn’t have the heart to tell them they were being conned, that their bosses were the Luddites, plus I was so astonished that my French kind of gave out. Really, I’m not the type to con children into believing in Santa Claus but I’m not the type to disabuse them of the notion, either. So with all that going on in my head, I just listened and waited for them to finish. So if you live out where the trash guys hate the whole idea of recycling and have decided to make it our problem, not theirs, here is the deal. The rule is, you separate everything yourself. 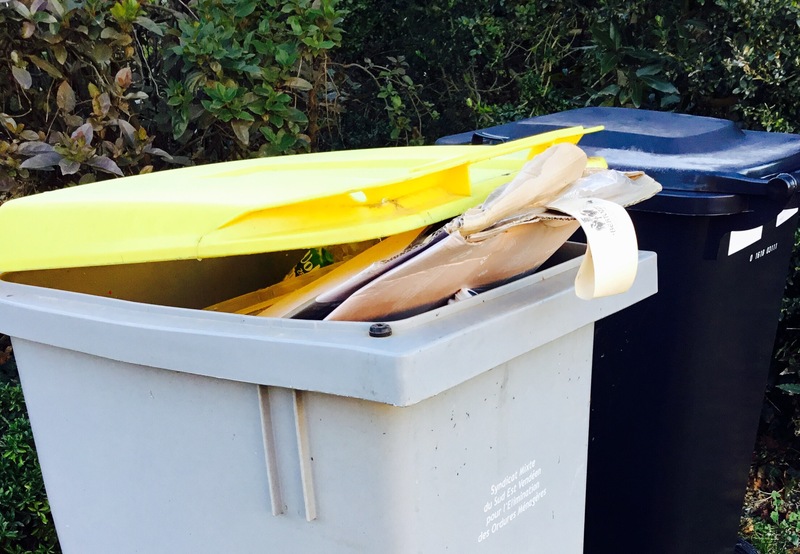 That yellow bin, where you see the paper sticking out? No no no, no paper. At all. Apparently that huge bin — huge by French standards — is to be used exclusively for hard plastic, something that almost never shows up at my house. That’s the bin where I am used to putting the cardboard and paper, just like in Paris. That’s when I realized this was true, Gandhi-style resistance to the whole recycling idea. Who knew that it could be used for evil, as well? The fix was definitely in; I know from Paris, that’s the paper bin, too. You can see that it is sized to handle more than the occasional milk bottle. In fact, in Paris we even put small dead appliances in that thing. Out here, you are on your own with the appliances and the paper goes in a little shopping bag — plastic, of couse, handed to me with ceremony and no sense of irony — that the young woman so kindly provided — smaller than the ones I take to the market. And you dump it every single time that tiny little thing fills up? Do they really expect us to do that? You will see that some of that paper is cardboard. So. The cardboard is collected and kept where, I don’t know, and eventually taken to the dump. I was given a card, also plastic, so they could track my dump visits. I live nowhere near the dump and am not sure I can find it. By this time I was getting a sense of why “bouche-bée,” mouth agape, I think I spelled it right, was taught and emphasized in my French classes. That was me. Actually, as I get used to life in France, that’s me pretty often. Anyway, finally they get to where their bosses tip their hand: the actual trash. The black bin — new, plastic, to replace the old plastic one that was in like-new condition — is for actual trash. However no actual trash is to be visible. It is all to be put in plastic, yes, more plastic in this supposedly enviro-friendly project, bags. Ah, so now I understood. Paper, bottles, that old toaster, whatever, just put it in a plastic bag and put it in the black bin. Think of it as the “don’t ask, don’t tell” bin. We actually have been dumping our bottles right along. We have been surprised that the bin is never even close to full. I’m not surprised any more. Our neighbors are using the black bin system. With all the roadblocks the local trash company put in the way of serious recycling, I can see why. It’s even more complicated. The EU plans zero landfill by 2030. But recycling depends on commodity markets. When the price is too low, stuff doesn’t get recycled. It’s easier to get people to always recycle than to tell them recycle or not based on market conditions. In my village, everything that can be recycled goes into one bag, and then it’s sorted. There are pros and cons of this. The pros are that it raises participation because it’s easy, and the truck comes by just once a week. The cons are that sorting has a cost, but then so would multiple collection trips to pick up each class of recyclable. Sorting at the source is thus easier/cheaper in a city while sorting after collection is easier/cheaper in rural areas. Also: paper and cardboard aren’t the same thing. You can bring down the grade of paper by mixing in cardboard; it matters less for paper to be mixed into the cardboard collection. Paper is a higher grade than cardboard and they have different markets and different prices. Also, food waste is the biggest stream by weight and volume. It doesn’t compost in a landfill because there isn’t enough air for the bacteria to do their work. So it’s mummified. One of the best things that can be done is collecting organic waste separately for composting. San Francisco is a leader in this. My husband rails about recycling all the time and seizes on any Facebook post that claims our recycling bins really end up in the landfill. But the situation is far more complex and nuanced than that. Zero landfill? Dream on. Anyway, as I listened to this little presentation — bless them, they really tried not to lecture — I couldn’t help but compare their procedure to San Francisco’s, that being where I moved from. In SF, they really do want to make this happen, so they do everything possible to make the program succeed. They went from asking us to sort everything to, eventually, just separating trash from recyclables. Their list of recyclables was extremely broad; here I was amazed at how limited it was. They added a green waste bin and encouraged us to compost on our own; here I had to introduce my gardener to composting and the trash guys don’t address it at all. There most food waste goes down the garbage disposal and is dealt in a central location; have you ever tried to get a garbage disposal installed in France? Hohohoho. The programs were quite effective. I know at our house we eventually threw away almost nothing. Most things went in the recycle bin. I actually toured the SF dump. It was impressive. They sort everything. Contractors have a special entrance for their skips, so everything can be sorted and reused; here my construction debris just went in the landfill. I was impressed that our guide loved trash, truly loved it. They were working with all sorts of companies to figure out ways to crush debris and use it to build roads, melt it down, collect methane from it, anything but just dump it and walk away. Their nightmare was disposable diapers. Methane collection only takes you so far. My take is that my life is filled with a lot of things. It is reasonable to ask me to do some basic sorting: trash, recyclables, green waste, and you’ll pry my garbage disposal from my cold, dead hands. Their life is trash. I see it as their job to track the economics, the nuances of sorting and reuse, etc. It is complicated but most people have their hands full getting the kids to school and themselves to work. We pay trash guys to handle the rest of it. It also seems to me that just looking at immediate costs and benefits is too limited. I think you need to look at the lifecycle cost of landfill to get a true picture of the economics of the whole thing. To get back to my take that day, I think the guys running my trash company were dragged kicking and screaming into this recycle thing. They reduced their list of recyclables to the minimum. Forget about that little triangle with the number inside; they only wanted the primo, easy to deal with stuff. They divided even that list into four separate components, with four separate locations to dump it. Green waste was not addressed at all. Take it from me, garbage disposers are about impossible to come by and scare the bejesus out of plumbers and electricians here. In SF, the goal was truly zero landfill. In Paris, it seems to be reduced landfill. Out in the boonies, the goal seemed to be absolute, grudging minimum compliance. I honestly think that was their only goal because their program is too limited and too complicated. Too much will go into the trash, either because the trash guys don’t want to deal with, say, recyclable styrofoam, or because householders will say the hell with it and bag up everything. And the amount of plastic they dedicated to making even that tiny effort? So not in the spirit of things…. When we were first in France, rubbish collection was new. Thus on taking over a new (old) house you would find caches of tins of fish, remains of boots and enamel dishes missing a bottom dug into surprising areas of the new (old) garden. The next era was the golden age. The dustcart would pass once a week and they chaps would collect anything you left outside your gate, whether in cardboard boxes or in galvanised dustbins – and once a month mattresses, old fridges and suchlike would earn a special collection. There were dumps…these were surrounded by wire fences with the necessary holes in same to allow access when the secretary at the mairie had gone home for the day. Wonderful sources of flowerpots (when the council chaps had cleared the cemetery after Tousaint) which cost an arm and a leg in the shops. Then the dumps were closed. Recycling centres opened, each with a fuhrer in charge of them. You could bring your stuff there, and unload it yourself while the resident gyppos decided whether it was worth carrying away. Things then became sophisticated. Yellow plastic boxes were issued: locally it was felt that with a plank on the top they made wonderful rabbit hutches. They tell me that they now have three different plastic bins…and the dustcart passes three times a fortnight instead of once a week…. Apart from the odd mattress or fridge we didn’t have much to dump. Food waste went to dogs and then to chickens…garden waste to the compost….plastic tubs were used for sowing seeds…tins was about it. Bottles? With every house came a stack of bottles. We continued the tradition. Oh, Helen, I’m with you on that last part. And how connected were the kids who got the PR jobs? I was boggled by the cost of an effort that is going to need serious revision to actually work. If you need a training session just to dump your trash, the system is too complicated. In Paris we do have three bins. They are collected often. It is no big deal. Trash goes down a chute here in the apartment and the rest goes in a little room that you pass as you head out the door. In the country, two bins, the recycle one almost totally pointless because so few things are allowed in it. Pickup is once every other week. I don’t know how families who live full-time out there deal with that. Plus then there are two community bins and the dump. I didn’t ask but I imagine old mattresses and the like would go to the dump. You would take them yourself, of course; the trash guys do practically nothing. In Paris they pick up large items any time, on call. Of course now there is another category, e-waste: computers and the like. Paris has special collection days. In the country, forget it. Previous Post The heat is on.